The trip began on Saturday, the 26th. My wife, Debi, dropped me off at Mark’s in-laws’ where I was meeting up with Tom and Mark to go on our annual hike. We hung out waiting for Tom for a little bit then loaded up the car and headed out. We stopped for a quick lunch at a Rumbi location, which is the restaurant chain owned by Tom’s boss (Tom is his personal assistant). Employees pay half price, so it was a cheap, good lunch. We then headed north, into the dark recesses of Idaho! We stopped in Pocatello for food and supplies and I got hit on by some girl in the store (I think she was hitting on Mark, but he insisted that it was me because I don’t wear a wedding ring; either way it was funny). The area near Borah Peak, which is the highest point in Idaho, is actually kind of interesting. There is a national laboratory there (The INL or Idaho National Laboratory) that does energy research. It is also the location where the first nuclear power plant was built and developed. We stopped for dinner in Arco at Pickle’s Place, a tiny little fly-infested diner. Arco’s claim to fame is that it was the first city powered by nuclear energy. The symbol of the county there, Butte County, is the atomic symbol – a nucleus orbited by electrons. They’re pretty proud of their nuclear heritage up there. Oh, and Pickle’s Place has a signature burger. Guess what it is called? The Atomic Burger. They also had a veggie burger that was pretty good (that’s what I ordered); Mark and Tom both got the Atomic Burger. We left Arco at around 7:00 or 7:30 and drove through Mackay before we realized we were basically out of gas. So, we turned around quickly and got some gas before making our way to the Borah Peak trailhead. When we pulled in we saw a bunch of cars, more than we expected. Most of the campsites were already taken. We stopped by the trailhead, where several people were hanging out and waiting and found out that a twelve-year-old girl and her father were still on the mountain. It was almost 9:00 pm at this point and getting dark fast. The girl’s mother had called the county sheriff when she didn’t hear from her husband, so he was up there checking on things. They came down safely a little bit after we arrived, as did another guy we met there. That other guy spent 15 hours climbing the mountain the day before – he started at 6:30 am and got back to his truck at 9:30 pm. We talked to another person who had done the hike on Saturday and she said it wasn’t that bad, but having read some descriptions and hearing about the people still on the mountain, I began to worry. We quickly set up Tom’s monstrous 10 man tent (it literally has three separate rooms) and climbed into our sleeping bags. I was pretty tired, so I drifted off to sleep right away while Tom and Mark played a couple games of chess. Thanks to a sudden surge in allergies (something I’ve only recently required), I didn’t sleep all that well (Mark’s snoring didn’t help either), but I managed to stay asleep until about 6:00 am when my bladder woke me up for good. I dozed for a while after that, but we were up and getting ready for the hike by around 7:00 am. We started up the mountain at 8:00 am. We thought we were the first ones on the mountain, but we found out later that there were at least four people who started before we did. We made pretty good progress during the first stage of the climb, which takes you from the trailhead up to the first steep incline. It was at the end of the first stage that we took our first break and were passed by some other hikers – a group of three (two guys and a woman) from Boise. They cruised past us. We started up after them and caught up to them just as the trail turns really steep as it goes through the top of the trail line. They had stopped for a break at that point and that is where we found out they were from Boise. We didn’t see them again until the summit. A second group of four men passed us (with their dog) in the steep section that eventually emerges from the tree line onto the barren rock that lies above it. Just as you emerge from the tree line onto a ridge there is a small windbreak that has been constructed to the left of the trail with a firepit in it. It was inside that windbreak that we saw another guy taking a break. He was hiking alone and must have started before we did. He was munching on some energy bars and said he was getting his blood sugar up for chicken-out ridge. We paused for a minute to chat with him then continued up on the ridge. You follow the ridge line for a while, walking along the western edge of a steep drop-off over gravel and volcanic rock. The views from here are pretty good and also offer the first real glance at the summit. You follow this mildly sloping ridge for about ½ a mile before you get to the chicken-out ridge, the notorious turn-around spot for some people. We didn’t really know when we had arrived at chicken-out ridge as there is nothing to clearly delineate it from the rest of the hike (i.e., no signs). But I’m fairly certain I know where it is now – once you hit chicken-out ridge you have to do some actual rock climbing. 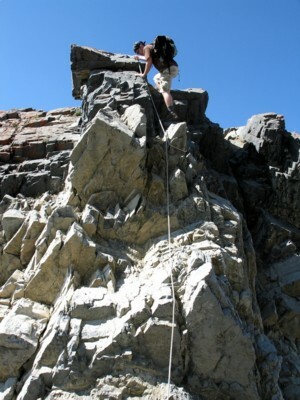 It isn’t anything too serious, but it requires the use of foot and handholds to scramble over and up rock. These aren’t loose rocks but large cliff faces that are sloped to about a 60 or 70-degree incline. The biggest problem with this area is that it isn’t very easy to see where the trail is – in fact, I’m not sure there is a clear trail here. Your best bet for locating the trail is to look for smooth areas on the rock that have been worn down. And, yes, you do need to be careful. On your left is a very high drop, ranging from 100 to 500 feet in height. To your right, there is an immediate drop of about 30 or 40 feet, but it falls onto a steep slope that drops about 1000 feet to a valley far below. A slip or mistake here could actually cost you dearly, but if you are sure-handed and footed and go slowly, you shouldn’t have much of a problem. That said, this isn’t a hike for the faint-hearted or young – these are dangerous, slightly technical areas that require caution. The three of us didn’t have a problem climbing this area as it really isn’t straight-up and the foot and hand holds are plentiful. Chicken-out-ridge continues for a couple hundred yards and ends in a 20 or 30-foot drop that does require a bit of rock-climbing. It is completely vertical. And while it has good foot and hand holds and even a rope now to help you, it is a challenging piece of climbing if you have never done any rock climbing. You can drop down a bit to the left of the ridge and skirt your way around this climb, but it requires hiking through very loose scree. If you aren’t a fan of technical climbing, that may be a good option for you, but it adds time and distance to the hike. After chicken-out ridge, there is a relatively level section of trail which is easy to see until you reach the last section before the summit. The trail leads across the back of a smaller summit and eventually to an exposed area that usually has snow on it. Given how late in the year we were hiking, this area was not covered with snow. When it is, it makes sense that ice axes and crampons are recommended – a slide off that notch would be a very serious fall. We could see some snow in shaded areas around the surrounding peaks, but there wasn’t any on the trail. 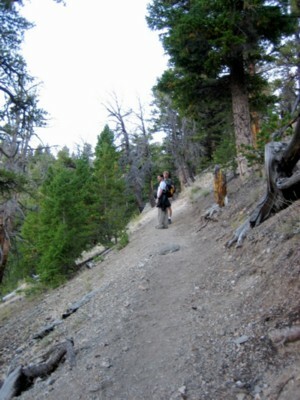 Having dodged that concern, we were still faced with the last section of the trail, the climb up the summit. As we approached the last section one more group of climbers passed us. There were about six of them and they were moving as effortlessly as though they were ghosts. Turns out they were technical rock climbers and in incredible condition. They didn’t seem to think the trail up the summit was challenging enough, so they climbed out on the large rocks and followed the ridge to the top. They climbed the last section in about 20 minutes. It took us nearly an hour. We don’t really train for these hikes, but we try to keep in decent shape. That said, I was feeling pretty good until the last push up the summit. If it wasn’t for that last section I don’t think this would have been nearly as challenging. But the last section up the summit is nasty. It’s about a 70-degree incline through loose gravel and very slow going (the people who took the ridge may have had it easier). On the way up the last section, we did pass two more hikers (a little boost of confidence for me). They had started earlier than we had but were traveling at about the same pace we were. We talked with them for a while on the summit – they were both from Idaho as well. Just as I was about to reach the summit the older guy I had spoken to the night before started down. 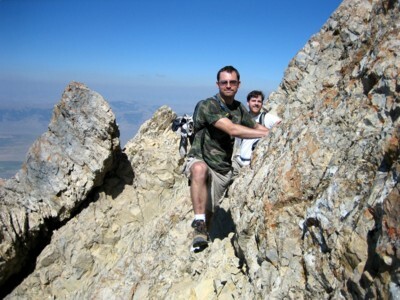 He was the first to summit on the day we climbed Borah. He was about 60 and, while he left before we did, he was moving quick. He was in very good shape and hiking alone. Tom summited about 5 minutes before I did, and Mark followed me by about 10 minutes – it was about 1:00 pm, five hours of hiking. The view from the summit was impressive, but I was so exhausted from the climb that all I wanted to do was sit down for a few minutes. There were about 15 people on the summit when we got up there, all the people who passed us on the way up. I sat down and had a bite to eat then laid down for about 15 minutes. It was so cold up there that I quickly donned my fleece jacket, gloves, and hat. Even with all of that on, I was still cold. I ate an apple and a protein bar then snapped some pictures. Tom took a brief power nap while Mark sat down and had a snack of his own. It was somewhat comforting to hear the woman from Boise say that she felt like she wanted to vomit when she finally made the summit – we weren’t the only ones feeling the effects of the climb and the altitude. Because of the cold and knowing we had a long hike down, we stayed on the summit for a little less than an hour (we started down around 2:00). Because I recently had knee surgery (okay, 1 ½ years ago), I was worried about my repaired ACL, so I donned a knee brace on the summit for the way down. It was probably a good idea as my knees didn’t like the steep inclines. I started down a bit before Mark and Tom but waited for them just below the summit. We then slowly worked our way toward chicken-out ridge and followed that to the ridge below. Going down was pretty easy going for the most part at this point. We also looked for the guy we passed on the way up who was hiking alone. We never saw him again. We’re guessing he was the day’s only victim of chicken-out ridge. He was a little older, probably 55 or 60 and not in great shape. So, we’re assuming he turned back. Anyway, going down wasn’t too bad until we hit the really steep section that starts with the tree line. It took us about 1 ½ hours to get to there. It was at this point that my knees really started to feel the incline. They are weak and I could tell. About half way down this section they started to buckle on me and I had to really slow down. Add to that the fact that Tom’s Atomic Burger from the night before was now starting to come out as little, scented Atomic blasts and I was really not happy! Luckily, Tom and Mark pulled ahead a bit and waited for me at one point, alleviating the smell but not the weakness in my knees. I didn’t want to fall as that could damage my knees even more, so I just took it really slow. Both Tom and Mark were feeling the angle of the slope in their knees as well (Tom felt it in his ankles, too, as he has ankle problems while Mark and I have knee problems). From the top of the tree line to the trailhead took us about another hour. My guidebook mentioned this, but I’ll reiterate it here for emphasis – don’t underestimate this area and its effects on knees and ankles – it is really steep. I didn’t have a problem going up, but coming down was a killer. I hobbled off the trail at around 5:00 pm and slowly made my way to Tom’s car. We left the tent up when we started, so we had to pack that up, which we did quickly, then we climbed into the car, stinky, smelly, bruised, and tired, and headed out. We were not feeling all that well. I ended up with some minor sunburns where my sunscreen had worn off (my wrists, the back of my neck, and my nose) and a couple of blisters. My legs were already sore and very weak (thanks to a constant regimen of exercise – an exercise bike in front of the TV, I was back to normal in a few days). We stopped in Mackay for shakes and tater tots then cruised to Blackfoot where we filled up again. The rest of the way home was spent debating politics – me taking the libertarian/social democrat position (a weird combo, I know) while Mark disavowed interest in all of the corrupt politicians and Tom defended Glen Beck and Fox News. It was fun. Tom finally dropped me off at Debi’s parent’s house around 11:00. I inched downstairs and into the shower before collapsing in bed.